We love bread. I guess looking at my Bread Recipes section, you would have guessed that already. Though I have baked breads (and a lot number of them), I have not ventured into inventing my own recipes. I am yet to figure out the perfect science and equation of the ingredients and so I am for now content with trying out the existing recipes. Yes, I change a wee bit here and there but nothing far too out or very different. And the first time I tried, I was 99.99% sure that I had messed it up. I cursed my way through kneading the bread wondering what made me even think I could actually make my own proportion for bread. It took me more than half an hour of painfully kneading it to get it to a familiar state. 1. 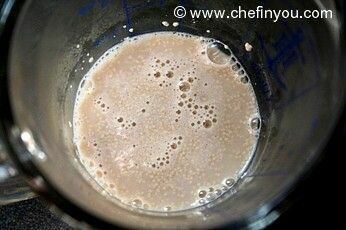 Combine yeast, warm water and sugar and let stand 5 minutes. It will get frothy like the picture below. 2. 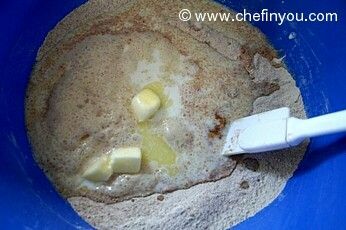 Combine the Graham flour, Vital Wheat Gluten and salt together. 3. Now add in the yeast mixture,milk, honey and butter. 5. 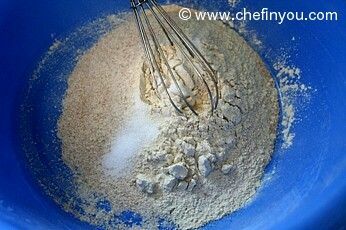 Now add in another 1/2 cup of bread flour. 6. Give it a mix. 8. and knead 5 to 10 minutes or until smooth and elastic. 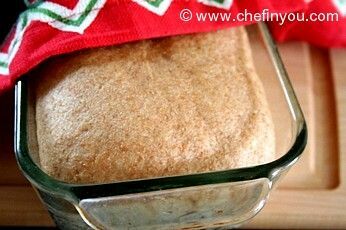 Use the remaining bread flour only if necessary. I used all the bread flour (that I have specified) and had to knead this thing for 35 minutes or so to get it to a smooth state. Although it was not a disaster as I believed it would be (in fact it was a hit), I think its not necessary to use the whole lot. 9. 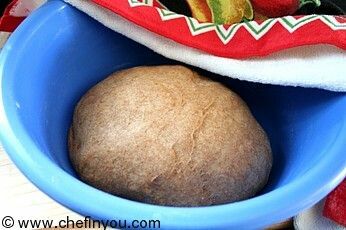 Place in a well-greased bowl, turning to grease the top of the dough too. Cover and let rise in a warm place (85°), free from drafts, 1 hour or so. 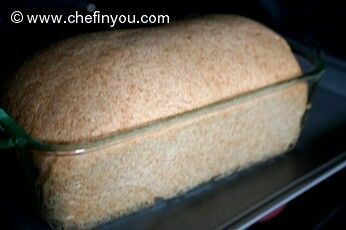 It won't double like in a regular white bread but it will rise up a bit enough for you to spot. 12. 30 to 45 minutes or until its almost doubled in bulk. 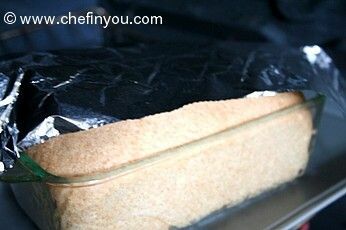 14. cover loosely with aluminum foil, and bake 15 more minutes or until loaves sound hollow when tapped. 15. 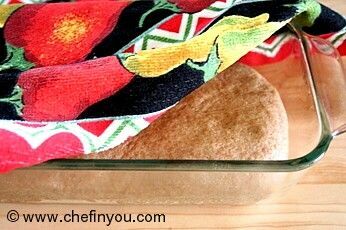 Remove from pans, and cool on wire racks. 16. Then slice them to enjoy! 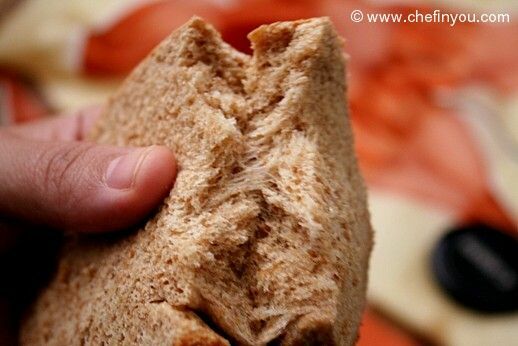 Can you see the spongy texture of this bread? 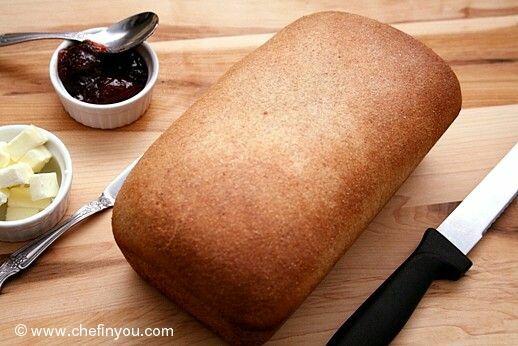 Immensely healthy with protein, it makes for not only a great breakfast bread ( peanut butter - jelly on warm slices. Yum!) but also makes a good sandwich bread. 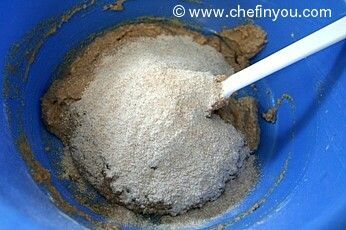 I recently bought some graham flour and immediately tried this recipe! I loved the soft texture inside and the crunchy outside. 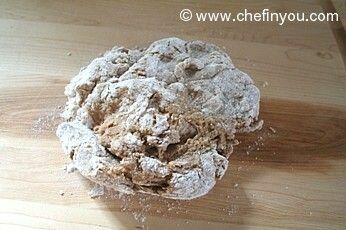 In addition, the grainy texture of the graham flour just tastes healthy and wonderful! I didn't have any wheat germ, so I added about 1/4 cup extra of white flour and let it rise (after step 6) for 20 minutes and then kneaded for 10-15 minutes (SOOO LONG... but not so bad if you're watching Netflix) and I substituted the honey for agave which tasted great too! Thanks again for the recipe!!! First of all let me say I am not a Chef. I'm not even a Cook. I am a communications engineer. Not a creative bone in my body. Wifey is out of town, I have a bag of Red Mill Graham Flour bought on a whim and a free Sunday afternoon. I decide to make bread. What could go wrong ? OK, well, for one, as I began pouring in my 2% milk I noticed it looked a bit...odd. Not lumpy odd, but kinda thick. Check the carton. It's heavy cream. Well, hey, what's wrong with that... so I finished off the last 1/4 cup with Almond Milk, the only other thing on hand. I may not be Alton Brown but I can MacGuyver with the best of 'em. 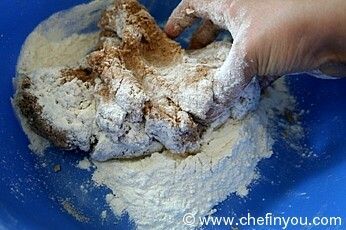 Then the bread flour. Hmm. It's in the right canister, but looks like whole wheat to me. It seemed that about 3/4 cup was enough. Dough is very elastic (thinking in comparison to inner tubes here). No Vital Wheat Gluten in the house, so I'll just skip that. Well, it actually rose. 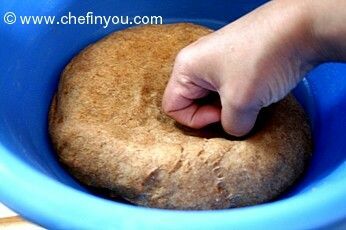 Punch down and form to a loaf, in the pan, back to rise. Not much rise this time, but pretty well fills the loaf pan. Suspecting I may end up with a patio paver brick here, but in the oven it goes. Sure smells good, though. Out and on the rack. Resist the urge to slice it until it's had 10 minutes (on the timer) to cool. 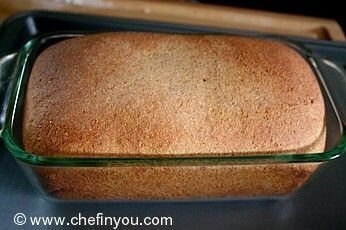 Hey, consistency isn't bad, kind of like a relatively light cornbread. Much lighter than date nut bread, or brick. Deep, nutty flavor. I like this. It would go great with something dark and rich, like beef stew. Off to find a Beef Stew recipe.... definitely have to try this again. what happens if you leave out the gluten? That loaf is so perfect! One step forward, one step back? I forwarded this wonderful post to my daughter who reminded me that she was now on a no gluten diet (sigh!). But I am thinking that perhaps the intention is key to making a wonderful bread? That as long as we use healthful ingredients and have the intention to make something wonderful, eventhough we might tremble some as we do it, something amazing will come? 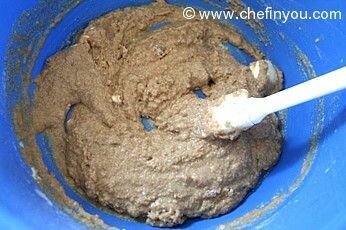 Reena, the thing about Graham Flour is kind of interesting though, and it may be there is something equivalent in India. It simply couldn't be a new trick under the sun? There is an internet citation about the Dr. Graham who originally made the original Graham crackers here in America from wheat grown in what was America's breadbasket in the early part of the twentieth century. 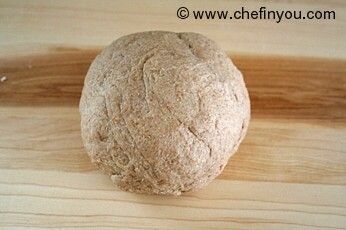 He took the milled wheat and added back into it the nutritionally valuable bran and germ. Usually these are illiminated. Perhaps they are too perishable. Or perhaps it is cheaper to separate them and sell plain white flours? But eventually the original w h o l e wheat graham crackers lost their edge, their special inclusion of the germ and the bran (sigh)... But I did find some whole graham flour at a shop in Little India here in N.Y. on lower Lexington Avenue and it was delicious but very very costly compared to many other wheat flours. Thanks again, DK! 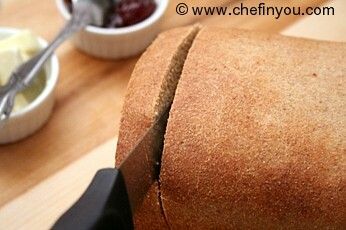 How wonderful to see your instructions and photos for a healthful bread here today. The hurricane has passed, and a new festival season is before me. 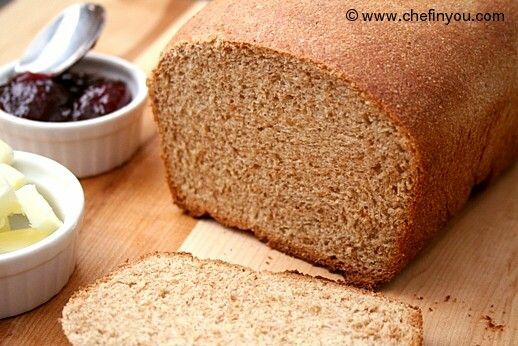 Just the perfect time to buy fresh flours and prepare a graham flour bread! That second picture showcasing the whole loaf - boy it turned out so good, so perfect. I am almost feeling the ecstatic happiness vicariously, as if i had baked it myself! Also, i never told you that my first successful bread was based on your wholewheat orange bread. So i have so much to thank you, for getting me to baking breads. No Graham flour here, so maybe i will re-visit that orange bread again.